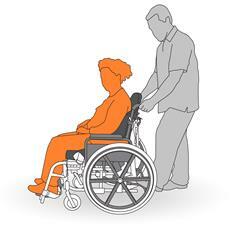 Muscular or skeletal injury to clients and workers from incorrect use of wheelchair. Injury to clients or workers from use of poorly maintained wheelchair. Injury to client resulting from a fall from wheelchair. b. 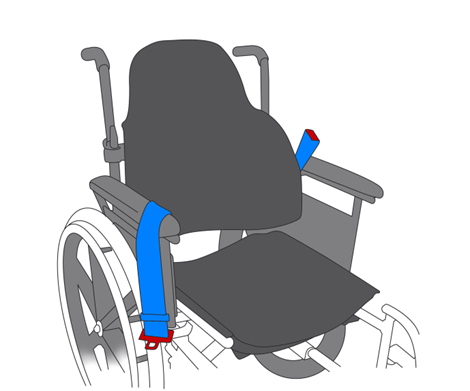 Each time before moving wheelchair, make sure area and route is clear of obstacles. c. Use forward and backward steps to push wheelchair, allow free flow of wheels. Check the wheelchair is in good condition, that tyres are inflated, wheels roll properly and the brakes work correctly. If faults are found, report immediately and do not use. If wheelchair has a restraint, check for signs of wear. If any faults, report immediately and do not use. Ensure knowledge of wheelchair operation. 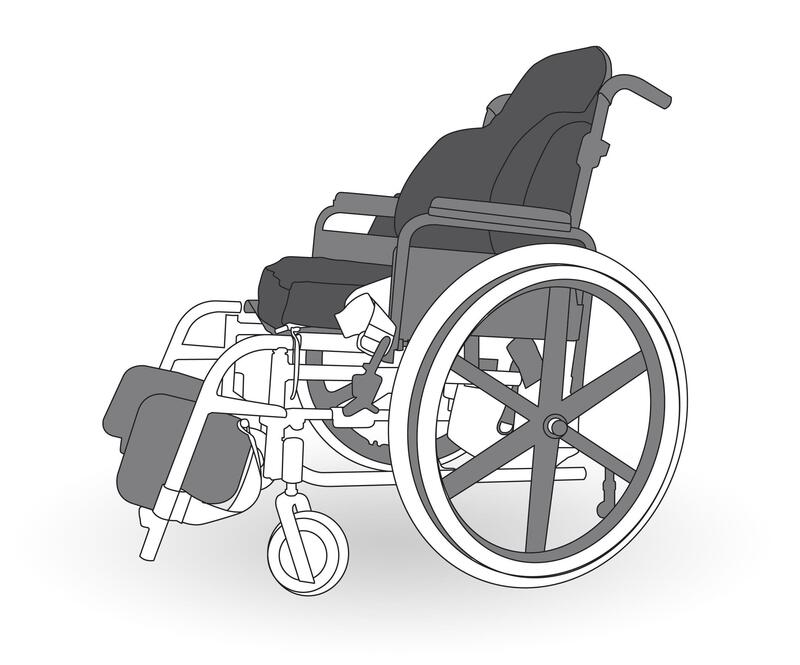 If unsure, review Standard Operating Procedure (SOP) for this wheelchair. Report immediately if SOP not available. Make sure wheelchair brakes are on. Use a ceiling or portable hoist to complete this step. Please refer to relevant SWI for use of a portable hoist. Make sure 2 staff perform this step. 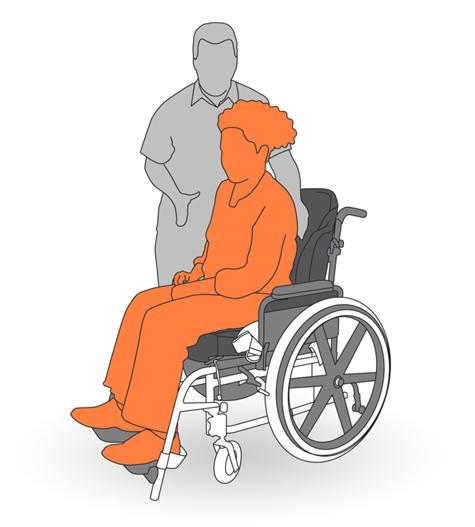 Seating an ambulant client in a wheelchair (refer to SWI for performing a stand transfer). Worker to stand as close to wheelchair as possible. Provide guidance to client during step. Fastening safety restraints and tray top. Make sure restraints are clear of seat before client sits down. Once client is seated, position restraints and tighten. Ensure tray top secured in place if required. Remove tray for travel in vehicles. Worker to stand in upright position, maintaining natural curve of spine. Have firm grasp of handles, with arms extended forward slightly. Take forward, even steps, push from thighs; let the wheels do the work. Keep a steady, slow pace when walking. Walk with the chair, do not reach. Tilting a wheelchair to manage a slight elevation. Sometimes, a wheelchair has to manage an elevation, such as crossing a doorway threshold. 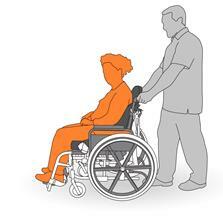 Failure may result in wheelchair jerking to a stop or tipping forwards and causing major injury. Stop the wheelchair, just touching raised elevation. Apply foot pressure at the tipping lever. This provides weight relief for the front castors allowing the wheelchair to lift slightly. Push forward, allowing front wheels to make contact with elevation, rear wheels will follow motion. Do not attempt this action on a step. Wheelchairs are not to be manoeuvred down or up steps. Pushing a wheelchair up a slight incline or ramp. Avoid steep inclines and plan another route. 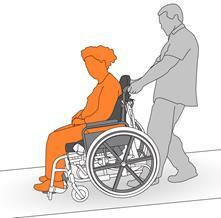 To manage a slight incline, stand close to rear of wheelchair, keep back straight. Push from thighs and lower body while walking, staying close to wheelchair. Do not take weight of chair. Pushing a wheelchair down an incline or ramp. Stand close to rear of wheelchair, hold handles firmly. 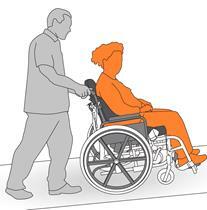 Lean back slightly when walking and place feet so as to slow movement of wheelchair (refer diagram). Move slowly with wheelchair until at bottom of incline. When stopping a wheelchair momentarily to perform another task, first apply the brakes and ensure the wheelchair does not move. At end of route, stop wheelchair and apply brakes. Make sure area is safe and free of hazards. Make sure brakes are on and client is comfortable. 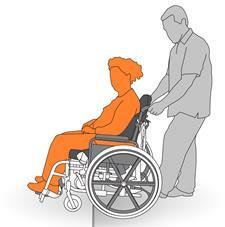 If required, release restraints on wheelchair.